I have a really quick post today and this 2-pager that I did for Two Peas. I love this Little Boy line from Echo Park paper. It's perfectly bold and bright for all of my little guy's pictures. This page is about his first summer and lists all of the things we did that year. This layout is copyright Two Peas in a Bucket. Nico's been on a newspaper hat kick lately and that inspired me to create a miniature one for this page. I sprayed it with a neutralizing agent so that it doesn't yellow or break down over the years. I added lots of pictures and big numbers from Cosmo's Circa line to coordinate. This was such a fun page to make. I love being able to "relive" Nico's babyhood by scrapping about it. 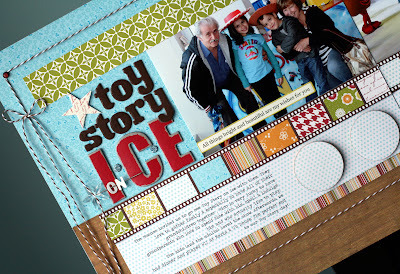 You can see the 2-page spread pictured together here in my Two Peas Gallery. I deleted my copy of it by mistake, so I didn't have one to post here on my blog- sorry about that! 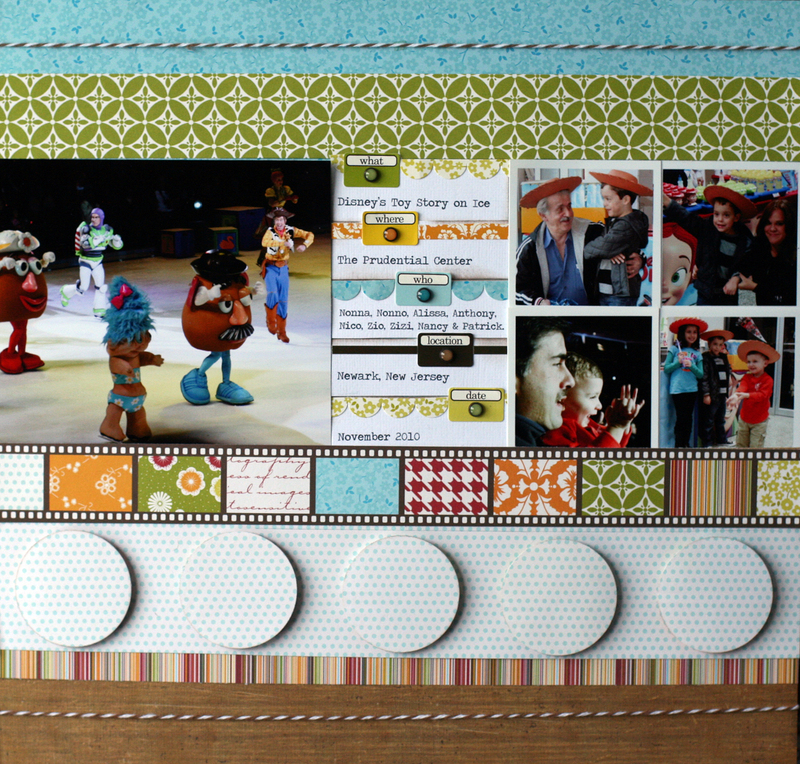 Here are few more projects that I did for the Cricut Circle using the Birthday Bash cartridge. I love the cute animals and pennants in this cart. I teamed up the cart with papers from My Mind's Eye Alphabet Soup line and some kraft cardstock to create this cute invitation. These cupcake picks were so much fun (and work) to make. I glued them on to lollipop sticks so that they would be long enough and sturdy. I bought this Chinese food box at Michael's and then decorated it with my Cricut. I'm in love with monograms, so I used the alphabet on the Birthday Bash cart to decorate the front of the box. The "surprise" banner adds a little something to the plain metal handle. And last up, is a tiara for the little birthday girl. I enlarged this cut to fill the page and then used glitter paper and pearls to dress it up. You can't see it from this picture, but I sewed two pieces of wide ribbon to the ends so that it can be tied on. I love birthday party planning and using my Cricut makes it a snap! I am so very ready for winter to be over! While I still can't put away the coat (or my socks), I can move on in my scrapbooks and work with some bright and sunny supplies. I love this Hometown Summer line by Pink Paislee. It's my favorite summer line released at CHA! You will see me use it over and over all season long. I don't think it's available for purchase yet, but I'm pretty sure that 2Peas should have it in the coming weeks. This page is about my little niece and what a good girl she is. Her little spirit adds so much to my life and to our family. I decided to journal right underneath the photos, since each one depicts her personality and what I wanted to express perfectly. 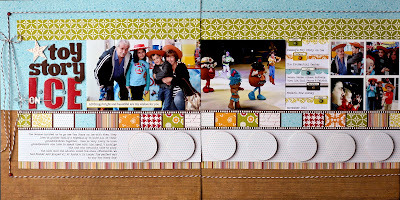 This layout was made for the Pink Paislee blog. My favorite part of the layout is this lollipop that I created from a die cut, a picture pebble, the large flower punch from EK and a white cookie pop stick. I bought the stick at Michaels and everything else is from the Hometown Summer collection. I added a strip of patterned paper and wound it around the stick for a pop of color. Click on any of the pictures for a closer look. I made this a few months ago, but I thought I'd post it here since I'm busy working on assignments and have nothing new to share with you (YET!). This is one of the very few cards that I've made for the Cricut Circle. I used the Birthday Bash cartridge and papers from My Mind's Eye. It was challenging, but I really like this card. So much, that I can't bear to send it out. What if someone throws it away? I don't know how cardmakers do it. When I make layouts, I know exactly where they are going to go, but this cute little bee could end up anywhere. Just can't do it. I've been away from my blog for far too long. I miss it. I don't have much to say except Happy Valentine's Day. I spent this morning with twenty little preschoolers at a Red Heart party. I'm really going to miss this school when Nico graduates this year. In the spirit of Valentine's, here's a little love layout I did for the 2Peas Garden. It's about my husband and the "love notes" he leaves me on my iPod. I like to call it a modern romance via Apple. I used a mish mosh of lines on this page - a little Snowy Day by Crate, KI Memories calendar page, Echo Park's grid and some flowers from Restoration by Crate. I love to mix things up like this! I wanted to do something a little different with a banner. I decided to hang these tissue paper pom-pom flowers (Martha Stewart), words, and hearts from some twine. It's a different spin on the traditional pennant banner and I think it fits the theme of the page better. I'm working on some baby pages, a Pink Paislee summer assignment and a Cricut page idea. Be back soon! I'm winding down, unpacking and gathering thoughts for my CHA round-up post. In the meantime, here is a layout that I did for the 2Peas Garden today. 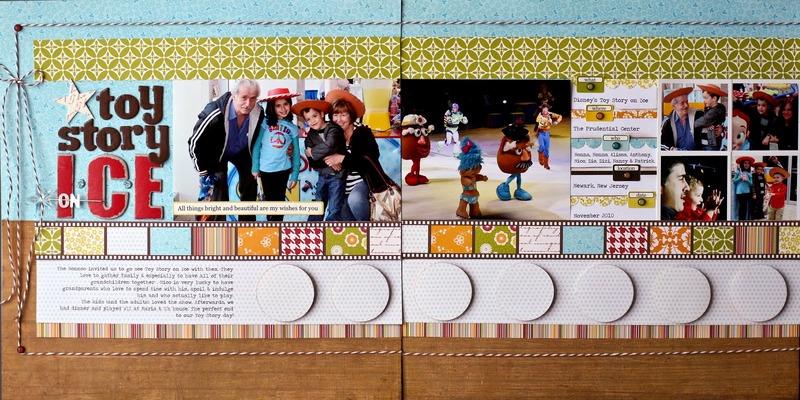 I used a mix of different papers from Jillibean Soup and Crate Paper for this layout. It's Disney, but I chose non-themed products because I wanted to keep the focus on the story which was the relationship my in-laws have with their grandchildren rather than the actual event. I decided to stack my title and added a little something different to it with the pin and the word "on". My favorite part of the layout are these cascading title bars. I used the stickers from Jillibean's Pasta Fagioli line to tell the who, what, when, where part of the story in a colorful, fun way. I'll be back very soon with my CHA favorites and another layout. I love this paper + glue thing. I love my boy and nieces + nephews. I love a good story (listening to one, telling one, or reading one). I love anything aqua and being married. I love to travel and especial Disney. I freelance in the corporate world and I (sometimes) love that too. 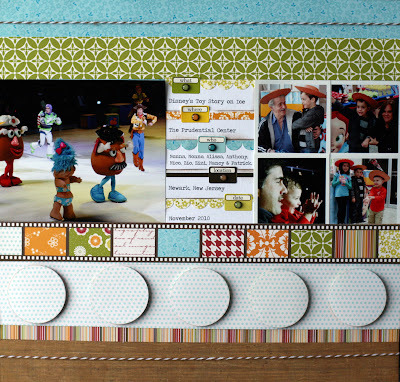 Neat and Tangled June Release | Hot Dog! I work for a handful of companies and receive product and kits to promote on my blog. All opinions are my own and honest. If I don’t like it, you won’t find it up on the blog. Occasionally, I use affiliate links and when you click on those I get a small commission. Thanks so much for your support, it makes this blog and videos possible!